"Corporate crime... Corporate crime... I could be robbed or poisoned by corporate criminals and never know it until I read about it in the papers... or maybe never know!" 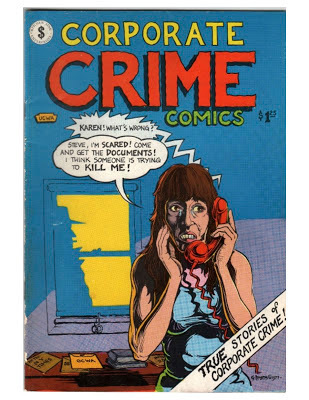 And so begins Issue #1 of the 1977 publication "Corporate Crime Comics" (CCC) by the Kitchen Sink Press - the first of only two issues. From an era before personal computers, smart phones, and tablets, Corporate Crime Comics is a great example of the creative efforts of activists from the time who sought to get their message out in a way that may grab the attention of a youth-oriented readership. Issue #1 includes around 15 stories of varying length and quality that touch on controversial, unethical, and quasi-legal or illegal corporate (and government) actions, all of which have fairly dire human consequences. The issue opens with the story of Karen Silkwood, a lab technician who worked for the Texan oil company of Kerr-McGee, which at the time was the largest producer of atomic fuel in the US. Silkwood had become active in unionizing and worker's rights, and had reportedly secured incriminating documents on the company, only to lose the documents - along with her life - in a suspicious car crash. This story was turned into the film "Silkwood" starring Meryl Streep, Kurt Russell and Cher in 1983. CCC includes the ITT (International Telephone and Telegraph) anti-trust case from 1972 that lead to the Watergate wiretapping scandal that undid then President Nixon. There is a short piece on California land-grabs by large oil-companies who then questionably divert water from federally-funded irrigation and dam projects. Other stories include cases about the exploitation of the elderly, ethical breeches of the pharmaceutical industry, oil industry-government collusion, the take-down of passenger rail in the US, toxic waste dumping in Japan, the Ludlow Massacre, and many more. There are a number of reasons to check out this piece of history in comic book form. Each story is drawn by a different artist, offering a variety visual effects. I have yet to see Issue #2, but apparently the goal was to combine a few issues into a book, however publishers reportedly balked at the idea and it never came to be. I found this issue online, but separated by page and in an odd picture format, so I converted each page and then combined it into a pdf for greater ease of viewing. What is perhaps most perplexing is that 35 years later, and these stories are still relevant. They still feel familiar, and stories just like them can be lifted from the pages of the news today. Time may go on, but some things are resistant to change - especially when money, power, and corporations are involved. Corporate Crime Comics - True Stories of Corporate Crime! What a great find! It does seem like it could have been produced today, even more so perhaps in our era of it-must-be-funny-to-be-noticed. Demon Seed!! This is like some crazy combination of b-side horror and activism rolled into a comic book. Cool. Some things never change it seems. This is the coolest thing I've seen recently. These are comics I could really become a fanboy of.